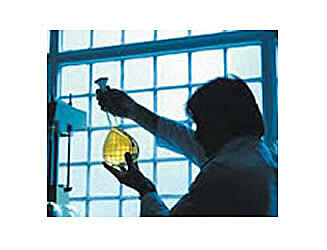 KDF Fluid Treatment has Patented Redox Water Filter Media for Primary and Industrial Treatment. In the mid-1960s, Don Heskett was a consultant to Morton Salt, where he initiated the development of new, experimental carbon block technology. Then, in 1972, Don worked with Bill Steger to develop a working prototype of one of the water treatment industry’s very first non-electric water softeners. Although both developments were innovative, they were also ahead of their times. In 1984, Don’s timing improved. In an experiment using cement as a binder for carbon cartridge filters, Don discovered—and "quite by accident," he adds—the powerful effect that a copper-zinc alloy could have on chlorine. At four o’clock in the morning, he used a brass ballpoint pen refill to stir some chemicals which contained chlorine. When he noticed that the red color which indicated the presence of chlorine had disappeared, his curiosity got the better of him and he spent the next day experimenting with different chemicals and various zinc-copper combinations until he was able to consistently replicate the same effect he had discovered accidentally. He had discovered the value of the electro-chemical oxidation process known as "redox" treatment which, in his experiments, reduced chlorine to chloride. Not only did Don discover an exciting new process for removing chlorine from water, he also opened up a brand new era in treating water. Don’s new process of using metal to remove chlorine and certain heavy metals from water ran contrary to conventional wisdom in an industry bent on using ion exchange to remove metal from water. But he held fast to his new process, and in three years he received the first of many patents to come. He also entered a licensing relationship with Zinc Corporation of America to manufacture KDF Process Media. Word of mouth, one-to-one education and many success stories convinced the water treatment industry of the viability and desirability of using his "discovery." Advertising and marketing generated many new leads and subsequent sales. Business started to grow. For three days in 1991, the U.S. Environmental Protection Agency shut KDF Fluid Treatment, Inc. down—until Don Heskett convinced the USEPA that their concerns about KDF Process Media were unfounded. In fact, the following year, the USEPA designated the popular KDF Process Medium as a "pesticidal device," by recognizing its bacteriostatic value when used in carbon filters. 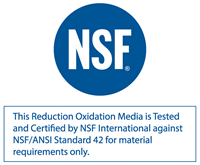 In 1992, KDF 85® and KDF 55® Process Media were certified by NSF International to its Standard 61 for drinking water. In 1997, ten years after KDF Fluid Treatment, Inc. became a member of the Water Quality Association, the WQA listed KDF media in its Glossary of Terms and Residential Water Processing and, also that year, KDF 55 Process Medium was certified to ANSI/NSF Standard 42 for drinking water. POE or POU Water Treatment Systems... Which type do you need?